It's another ho-hum weekend at the box office, with only one new release over 2,000 screens (and with people probably wishing that one didn't get them). One smaller, targeted release and an expanding indie film make up the balance of the new films that most movie-goers are likely to see in their local theaters. Like two weeks ago on Labor Day weekend, this leaves the opportunity for returning films to breathe easy and perhaps gain some of their lost momentum back. A very full slate coming next weekend makes this perhaps the last opportunity to capture the attentions of audiences that will soon be very divided. Stealing Harvard looks primed to be the whipping boy for fall comedies this year; not only does it feature apparent cinematic enemy number one Tom Green, but the seemingly non-stop commercials feature some of the most mind-numbingly unfunny jokes that could be imagined as possible selling points. I don't think any of the cool kids will be going around yelling, "I wanna be Steeeve!" on Monday. What attraction there is to this film will be split between Jason Lee and Tom Green. Lee, of course, made his name through Kevin Smith's films, especially Chasing Amy. He's not been limited to Smith's personal acting troupe, though (I don't see anyone banging on Jason Mewes' door with scripts), and has gotten his biggest exposure in two Cameron Crowe films, Vanilla Sky and Almost Famous (I think everyone wants to forget Kissing a Fool at this point). I still have trouble with the idea of him as a leading man, although he's got some passionate fans. Whether Tom Green still has any left after Freddy Got Fingered is a more intriguing question. He's probably used up forever all of his potential goodwill after making the most universally panned movie of 2001 (I maintain that it's a misunderstood piece of deconstructionism), so any film that features him will immediately limit itself to an audience that can tolerate him, with little chance of fence-sitters plunking down their $8. This is especially true when the film looks as bad as this (although I predict the number one phrase in reviews for this film will be "not as bad as it looks"). Anyone remember Trapped in Paradise, the Nicolas Cage crime "comedy"? Anyone want to? Stealing Harvard perhaps compares unfavorably with that, impossible as it may be to believe. This will not be the film to either bring back Tom Green to respectability or launch Jason Lee as a mainstream comedy lead. It should gross between $5 and $6 million this weekend and shouldn't surpass $20 million total. Ice Cube remains the rapper-turned-everything with the most consistent track record. The occasional Ghosts of Mars debacle aside, as an actor/director/writer/producer, he's turned most of his projects into at least modest successes, converting his natural charm into a record of crowd-friendly flicks. Barbershop represents something a little different from films like the Friday series, in that it looks to be a little more dramatic than the "party" films he's come out with in the past. The day-in-the-life-of theme recalls a little of Do the Right Thing without the racial politics, and that charm that I mentioned earlier definitely shows up in the advertising for the film. It's not just Ice Cube who's the draw for this film, though, as Barbershop features a veritable who's-who of young black actors. Sean Patrick Thomas and Cedric the Entertainer (who's making a career out of comedy pinch-hitting) are just two of the members of this talented cast. While black-targeted films (I reject the label "urban") do well enough on screen counts as small as 850, Barbershop is being launched by MGM on 1,605 this weekend, in a rare display of confidence. It's clear they're hoping for a mainstream breakout, and it's quite likely they'll get it. 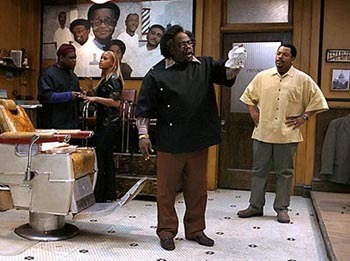 Barbershop looks to be able to take in at much as $11 million for this frame, a figure that could make it Ice Cube's second number one film, after Next Friday. The only picture to really have a chance to challenge it is My Big Fat Greek Wedding, which ironically enough has been the bridesmaid of the box office for the past two weeks. In what I feel has been a missed opportunity, IFC hasn't expanded the film much beyond the 1,600 venue level, which has prevented the film from taking the number one spot in the last couple of weeks. It's on 1,764 this weekend, and if it manages to maintain its approximately $6,000-per-venue average, this gives it about $10.5 million for the weekend. This puts it very close again to the figure I expect to be the top box office of the weekend. This is perhaps its last chance to take the number one spot, but if it fails, three straight number two finishes to three different number one films would be a rather unique feat in and of itself. The $100 million milestone, something that probably wasn't even joked about while the film was being made, will be reached on Friday, as it sits at $98.6 million as of Wednesday. Expanding into wide release is One Hour Photo, starring Robin Williams. The last of his three dark roles for this year, this is the one that relies on him the most for its box office success, as the next biggest name in the film is probably Eriq La Salle. Williams plays the creepiest photo clerk you'd never want to meet and takes his relationships with his customers a little too seriously, if you know what I mean and I think you do. It's been picking up buzz ever since its Sundance Festival premiere and has performed reasonably well in the couple of weeks it's been in limited release, finishing as high as number one two weekends ago in just 164 venues. Now in 1,177, it gets the opportunity to crack the top five in this weak market. With Robin Williams' role being hailed as a serious contender for Oscar recognition, it's crucial that the film make the most of its opportunity to be seen. Although its dark subject matter may turn a number of people off the film, one can't help but think about another extremely dark fall thriller that managed to wow audiences: Se7en. It doesn't appear to be quite as revelatory as that 1995 David Fincher film, but the surface comparisons are there. The genuinely creepy ads make it an intriguing prospect for those not afraid to take a look at the dark side of humanity. Even on this limited number of screens, One Hour Photo should take in about $8 million for the weekend. Last week's number one, Swimfan, looks like it could use a life preserver. Having already fallen to number three in the daily box office (though admittedly, its core audience may not get to go out on school nights), it's extremely vulnerable to a massive drop this weekend. Even the core under-21 audience didn't care much for this high-school players version of Fatal Attraction, giving it a tepid B at CinemaScore. It ought to fall to around $5.5 million this weekend, making even a $35 million total gross a difficult task. The other big opener, City by the Sea, looks to be in better shape, but not much. Taking just under $9 million last weekend, the Robert DeNiro cop thriller didn't appear to distinguish itself from any other thriller, making the likelihood that it will catch on as a word-of-mouth hit extremely small. It'll earn another $5 million or so this weekend, but it also looks headed for a sub-$35 million finish. Also finishing in this range will be Signs, which will officially become the number one film of summer this weekend, passing Austin Powers in Goldmember, which it sits just $500,000 short of as of Wednesday. Signs now looks to be closing in on a $235 million finish.